There was a bass tournament on Lake Wicwas this weekend, with lots of bass boats poking around all the coves on Saturday. The fishing is still good, as the fishermen we spoke with were quite pleased with their catch. I even caught a nice largemouth right off our dock on Friday evening. Even with all the dry weather, mushroom season is starting. 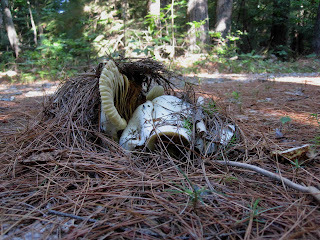 I love the way the large mushrooms form underground and then emerge, pushing all the leaf debris right up with them. I found fresh Indian Pipe also. The Fragrant Water Lillies are blooming everywhere; Arbutus Hill Pond is covered with them. I have seen lots more owl activity the past week. Up by Arbutus Hill Pond this morning I saw one fly over the trail, and this evening there were two owls calling behind our house. For quite some time they just called back and forth answering each other. Then a third owl joined in, and the tone changed to a much more threatening call, and that was it - they were all gone. The weekend ended with a nice sunset and cooler temperatures.